Its been a long time since I hauled..So,I went and did some retail therapy!! 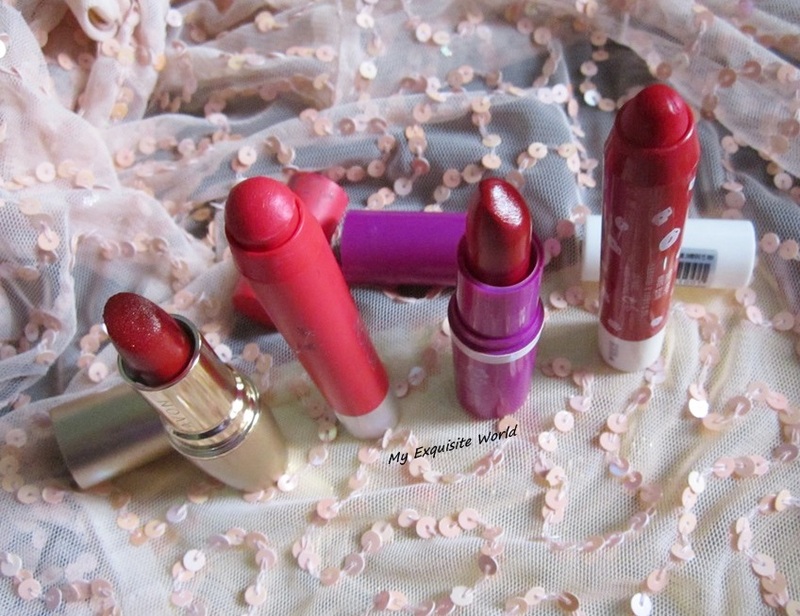 Here are the products I bought..
Color Show Lipsticks-Red Diva, Plumtastic, Caramel Custard & Fuchsia Flare. 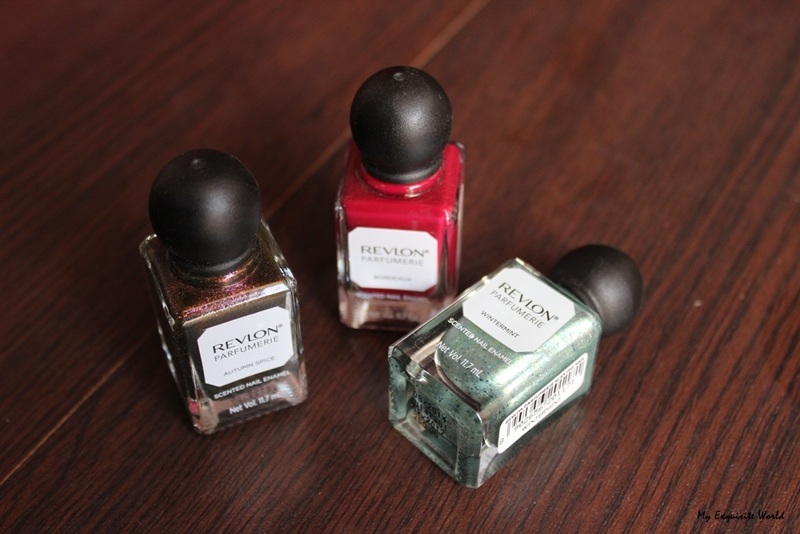 Revlon Parfumerie Nail Enamel-Autumn Spice,Winter Mint & Bordeaux. Have you tried any of the products listed above.I am trying the stuff out.Reviews will be up in a few days! 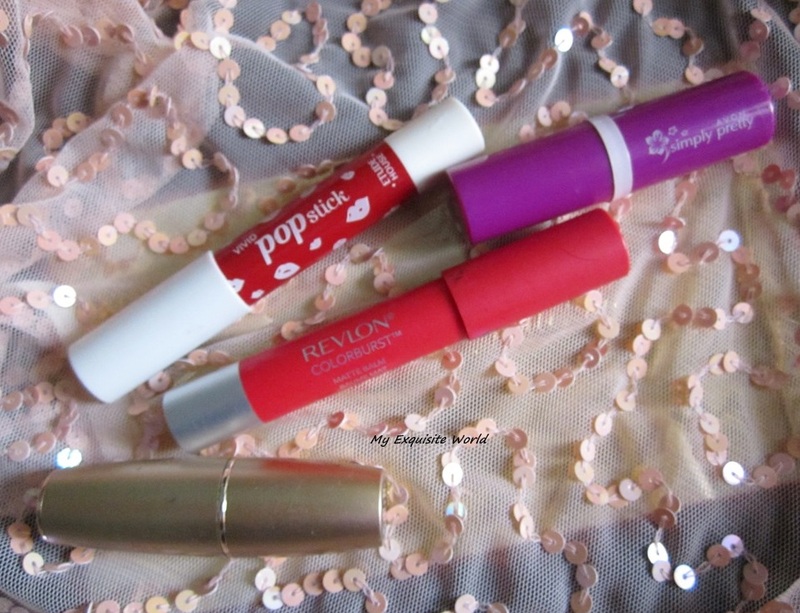 4 Red Lipsticks to suit every occasion!! ‘When in Doubt;Wear Red’- An absolutely true statement!! Red is one shade you can carry to any occasion.However,the intensity and finish of the color does matter.Below I have 4 Reds from my stack that can fulfill the need of all occasions!! Avon Ultra Moisture Gold Shine Lipstick Ruby in Gold (rs.469 for 4 gm) :Ruby in Gold is a gorgeous pink based red.It like deep strawberry red shade that gives a juicy look to lips.The shade is loaded with ‘Gold’ aka golden shimmer that are very obvious on lips. 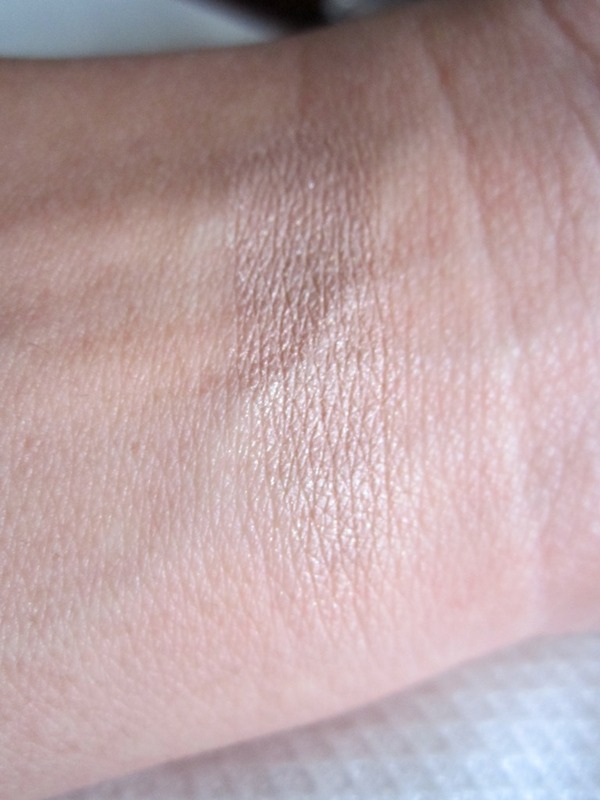 The lipstick has a soft creamy texture that glides on smoothly.It applies well but the shimmer present can be felt.The shade stays for about 4 hours fading evenly but the shimmer settles in the lip lines and stays afterwards too.The shade is decently pigmented providing medium to full coverage.It will suit all skin tones. Revlon Colorburst Matte Balm Striking(240) : Priced at rs.800,Striking is a stunning shade of red with warm undertones.It is very wearable and not OTT. The texture of the lip balm is very smooth and velvety soft. It glides on easily without any tugging or pulling. 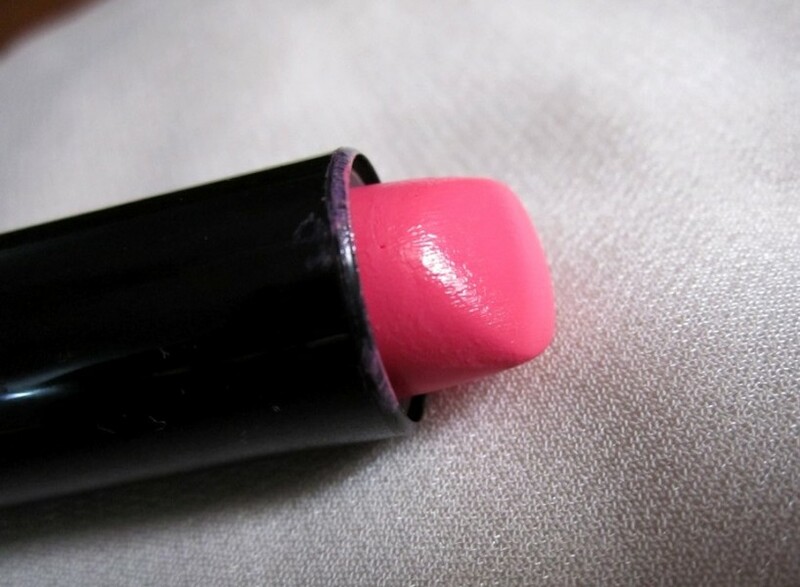 The lip color has a satin matte finish on initial application which soon settles to matte. Though, it is matte but it is very comfortable. It doesn’t settle in the lip lines either accentuate them. 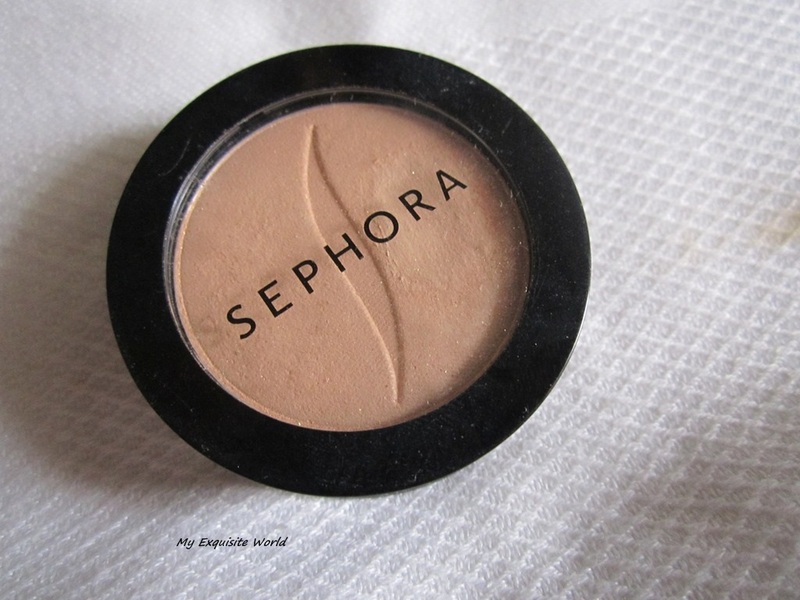 The shade is decently pigmented.It provides medium to buildable coverage and covers pigmented lips very well.I love the finish that provides a classy look to the face.It stays for about 5 hours on me leaving a very mild stain behind. 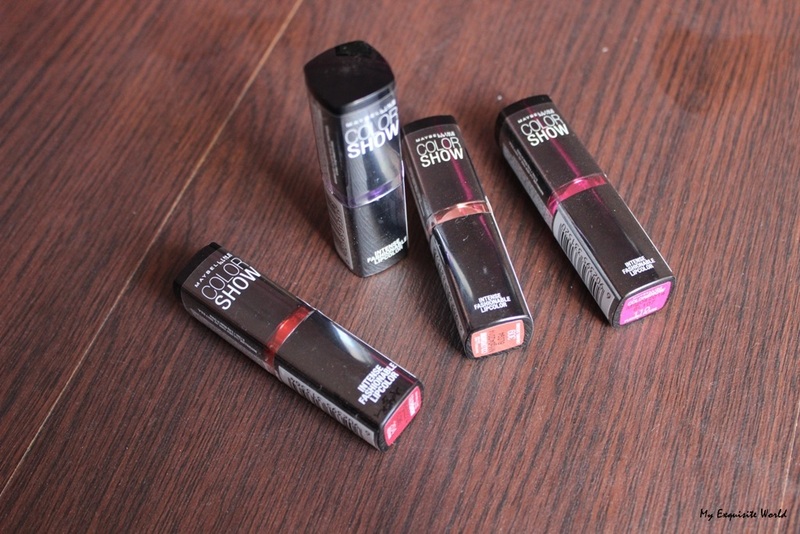 Avon Simply Pretty ColorBliss lipstick Cherry Red (Rs 169 for 3.5 gms.) : Cherry Red is a stunning red shade.It ha s minor blue undertones that aren’t much visible.I like such reds as it can be called a true deep red.It has a slight sheen and not matte. 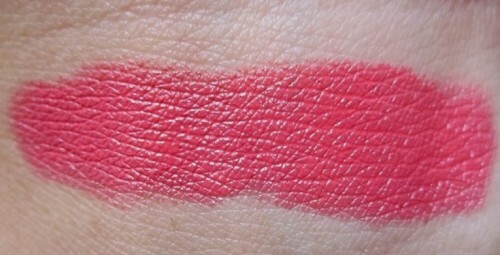 The texture of the lipstick is smooth and it glides on easily.The formula isn’t hydrating but it isn’t drying as well.However,one should exfoliate the lips prior applying it as it is a deep shade and it definitely stains.It can accentuate dry flaky lips.The shade is insanely pigmented and one swipe is all that is need.I only do the pin-up look when I use this as it itself is a statement shade.The shade stays for 5 hours leaving a reddish stain behind that goes with proper cleansing. Etude House Vivid Pop Stick #8-Crazy In Love ($11) : Crazy in Love is a crazily pigmented pink undertoned red.The shade is very stunning and brightening.It brightens up my face and makes me look all the more fairer.The shade is sans any shimmer or shimmer.It is a classy matte. It is easy to apply without any pulling or tugging.The formula is creamy and settles to a matte finish.It isn’t very matte that is dries up the lips but comfortable enough.The formula is light weight and very comfortable in wear.It doesn’t accentuate dry lips but it does settle int he lip lines. 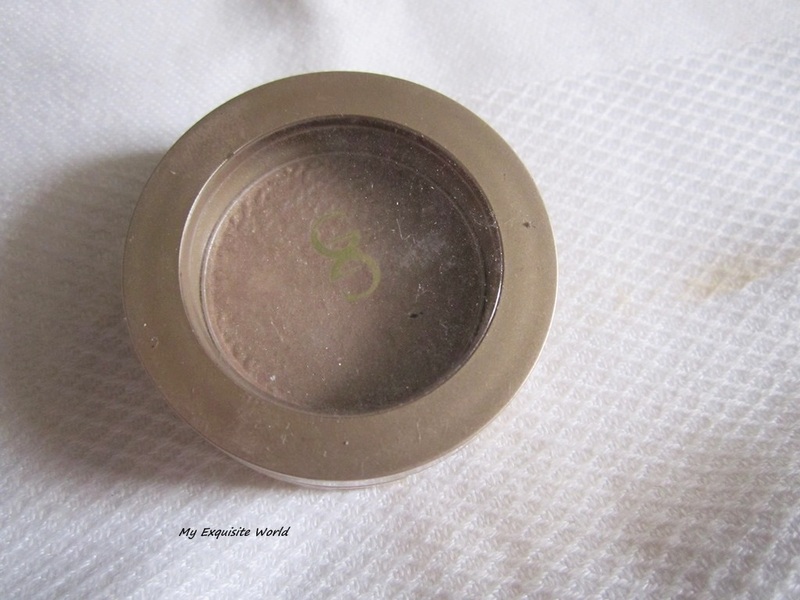 The shade stays for about 6-7 hours intact with meal included and the n it leaves a stain behind which too stays and goes away with a cleanser.It is water resistant.It provides full coverage in one swipe with minor touching around the lip corners. Sometimes,I do mix Striking and Crazy In love to get a shade that us a mixture of both and it looks great too.Ruby In gold is a shade that is more suitable for special occasions,parties.Striking is a great Red for office wear,or lunch out with friends.Cherry Red and Crazy in love are the bolder shades that add oomph and can be used as a statement lipcolor when you keep rest of the look minimal and let the lipcolor do the talking!! 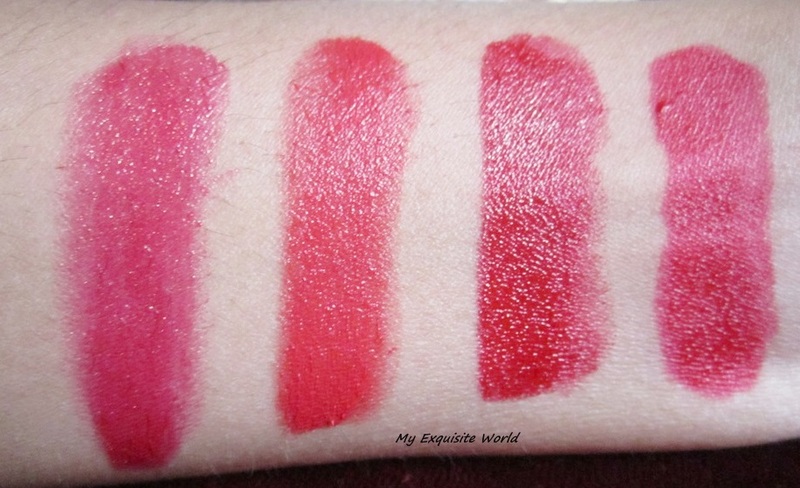 I have MAC Dangerous and MAC Ruby woo as well which I love flaunting.Will post a review and look on the these shades soon!! I am loving bright-colored lipstick shades these days specially those with neon touch.These are super fun to wear and add a pop of color to face.However,I have learnt that in order to wear these shades and look perfect,one needs to have a perfect base. Neon shades have a tendency to accentuate our undertone and evenness or darkness around the mouth.So,always remember to have a good base underneath if you want to flaunt the shade perfectly. 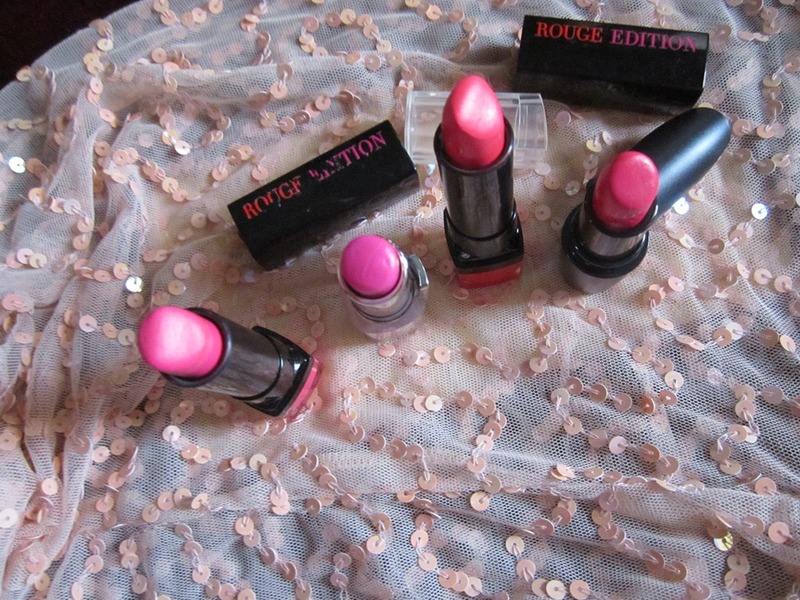 Bourjois Rouge Edition Lipstick #12 Rose Neon (Rs 995 for 3.5 gm ): Rose Neon is a gorgeous Barbie pink shade-a bubble-gum pink with slight blue undertones. I would not call it neon in the truest sense. 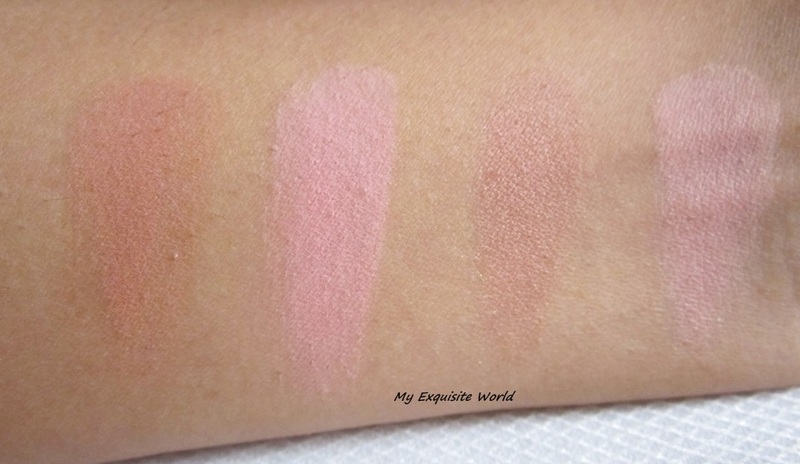 Just that it is more brighter shade of light pink .It is devoid of any shimmer. The lipstick feels comfortable on lips even after 3-4 swipes but I feel that too much application leads to formation of slight lines if lips are pressed. It doesn’t settle in the lip lines.The formula is amazing and mositurisng. 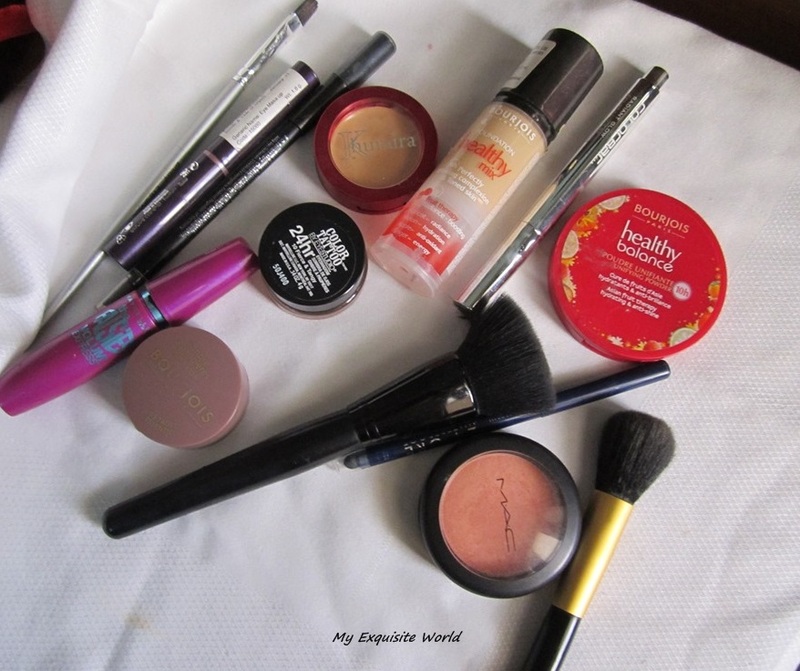 It doesn’t accentuate flaky skin neither dries out my lips after it wears off. I love the glossy finish and the way it makes my lips appear full. 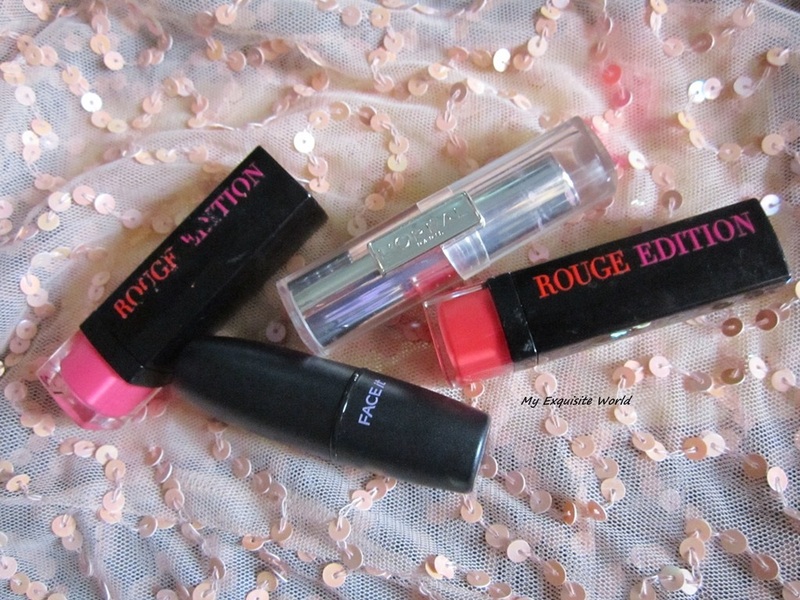 Loreal Rouge Caresse Lipstick Cheeky Magenta(rs.499 for 2.5gms):Cheeky Magenta is a very girly light magenta pink with cool undertones.It is such a Barbie doll shade.The shade does have slight blue undertones but it’s not very prominent. Cheeky Magenta is very glossy and hydrating.It stays for about 2 hours on my lips but doesn’t leave any stain behind.It can be used sheerly as well as for full coverage. 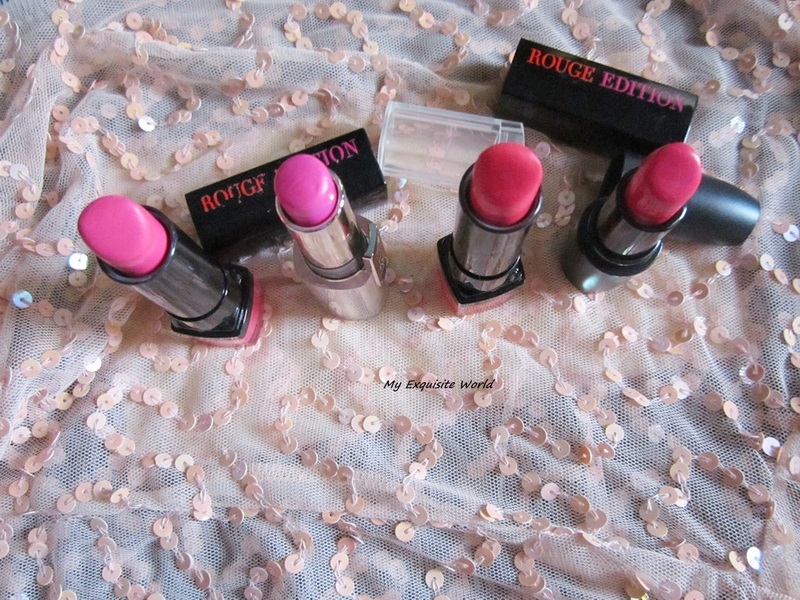 Bourjois Rouge Edition Lipstick Fraise Remix (Rs. 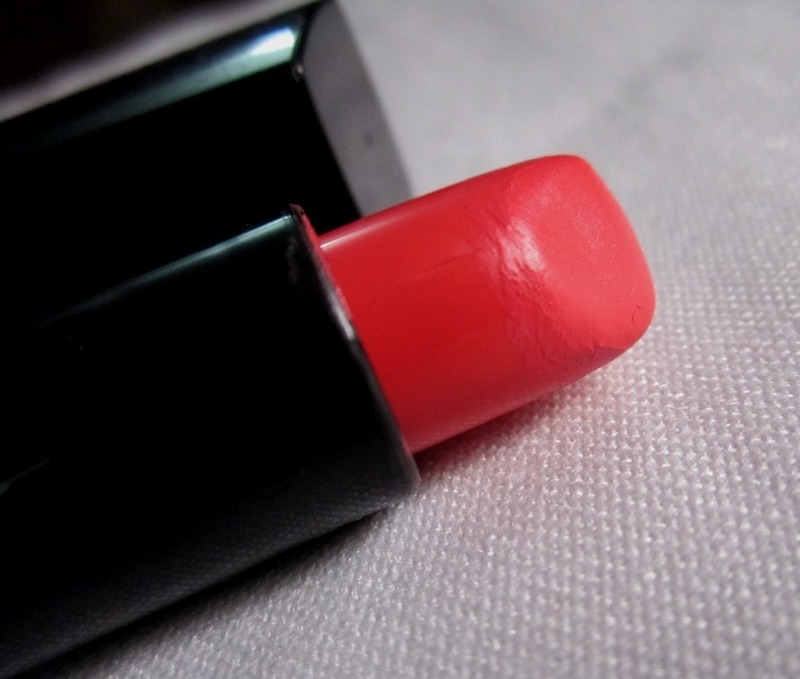 995 for 3.5 gm) :The lipstick is a stunning shade of coral with red-pink tones. It has slight neon effect in it which isn’t overpowering. 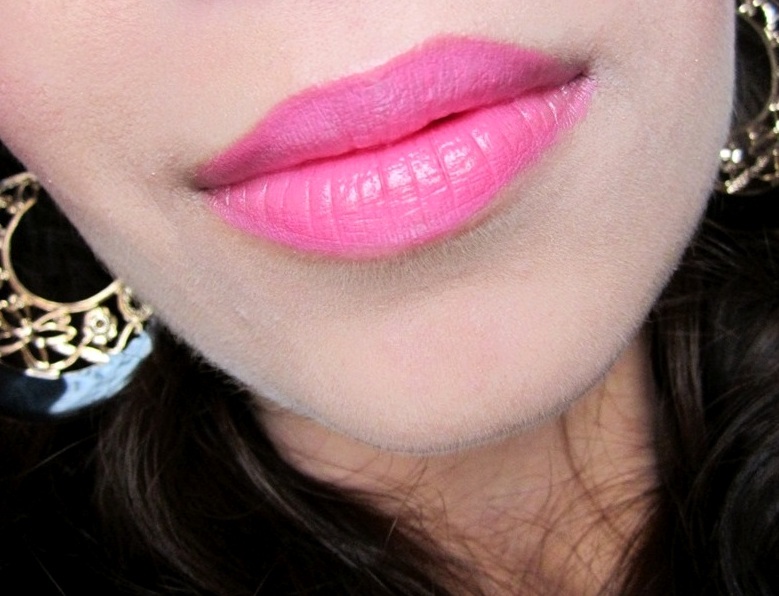 The lip colour is sans any shimmer or sheen. The lipstick has a creamy texture. It feels soft and glides on smoothly. The formula is light weight and moisturising but it isn’t very much hydrating.It provides glossy finish to lips which settles to matte finish after 2-3 hours. 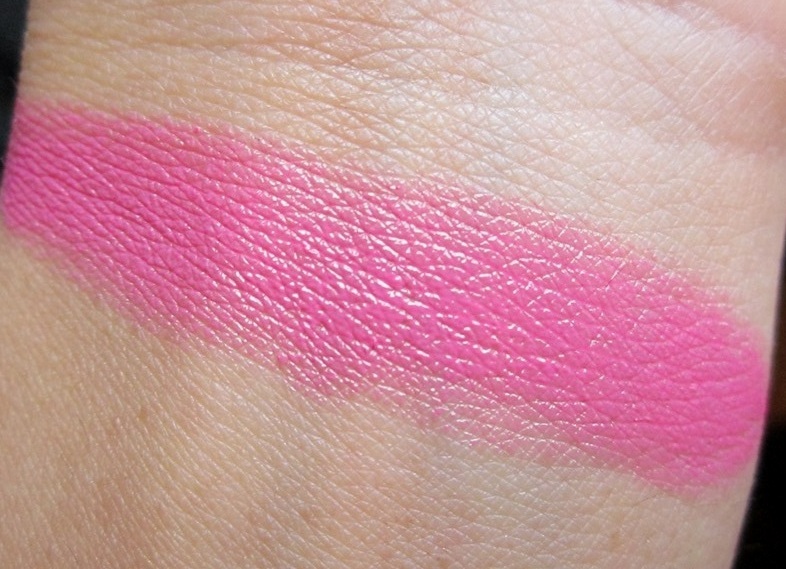 Face It Artist Touch Lipstick RD301 (8.99$ for 3.5gms):The shade is a gorgeous coral pink with creamy finish.It is sans any shimmer or sheen.Pure delight!! 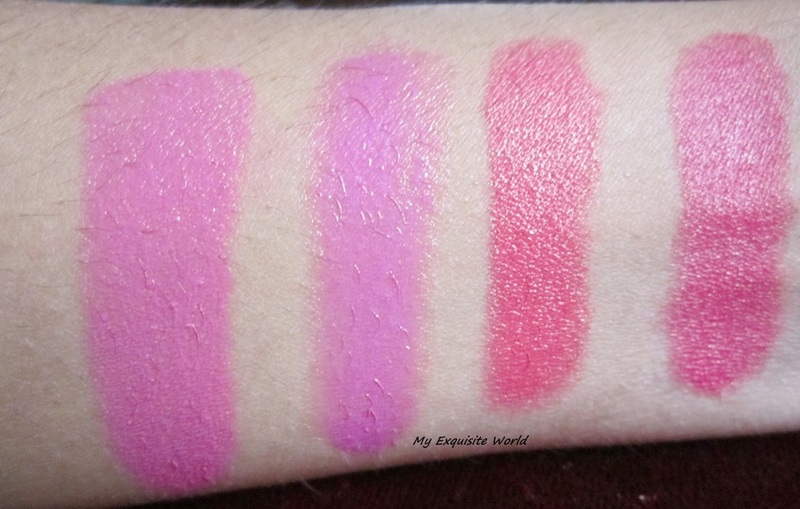 The texture of the lipstick is really smooth and it glides on easily.It applies evenly and doesn’t bleed.The formula is light weight and feels comfortable on lips.The finish is rightly described as creamy matte.It is non-drying though not very hydrating.The shade doesn’t settle in the lips lines neither accentuate them.It stays for about 4-5 hours on my lips leaving a mild pinky coral stain which looks really pretty. 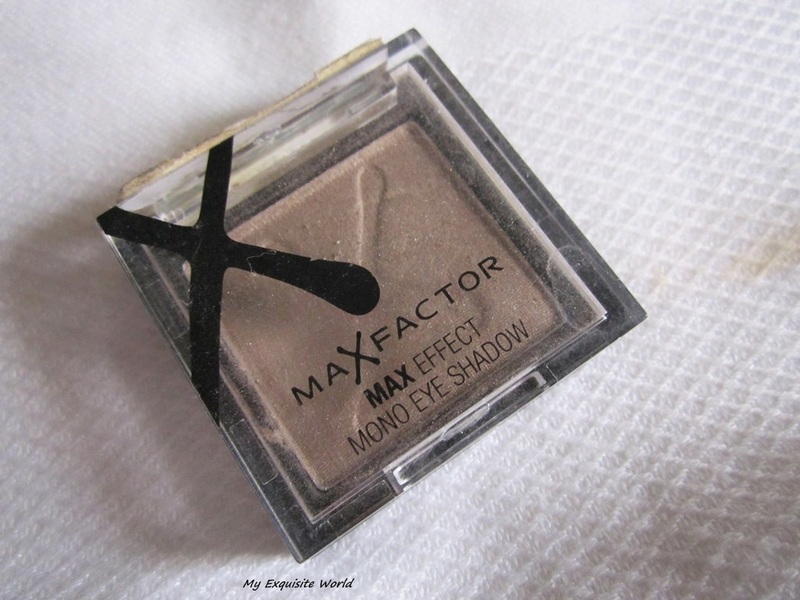 5 Everyday Wear Eyeshadows-my picks!! 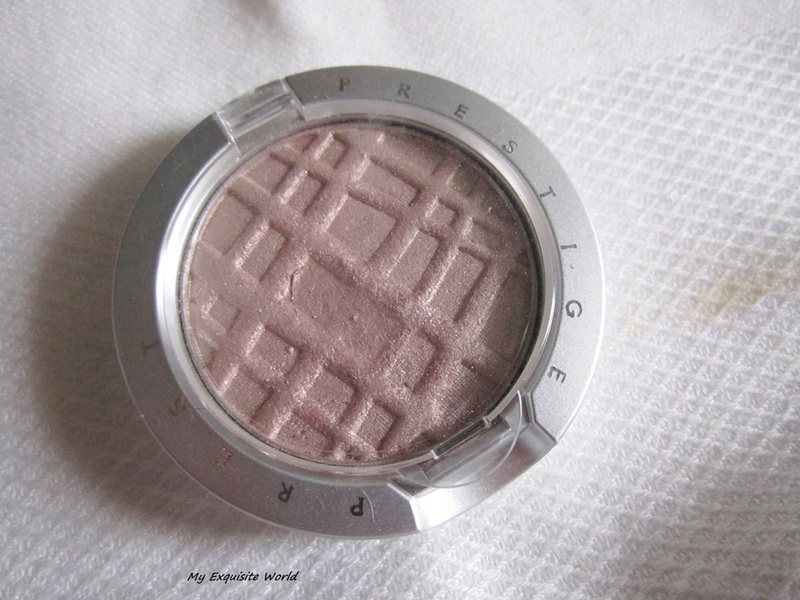 I love wearing eyeshadows as they make the makeup complete and I like decorating my eyes. 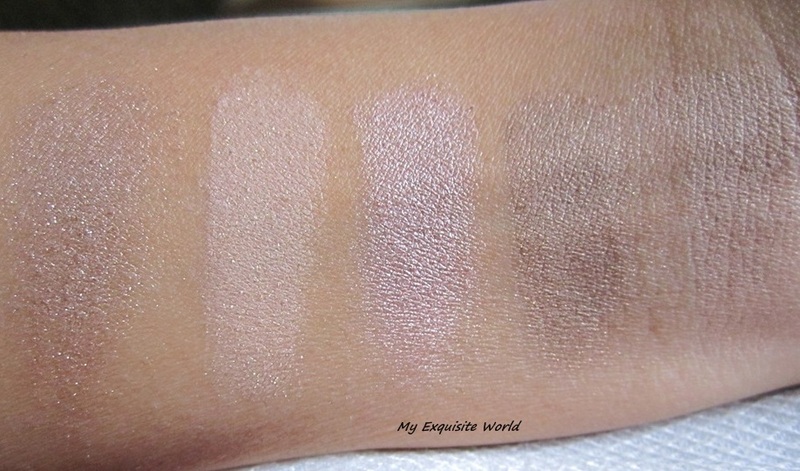 However,there are occasions where we cannot wear colourful eyeshadows or for daily wear or office.This is where I use the below mentioned shades.These are subtle and great for daily wear.Also.these can be used along with darker shade in the crease for smokey look. 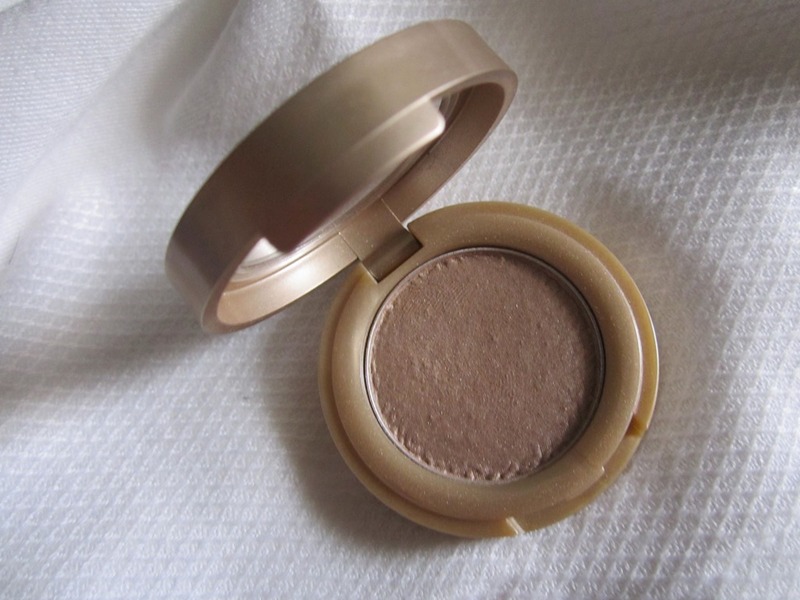 Covergirl Eye Enhancers 1-Kit Shadow Tapestry Taupe 760 : Tapestry Taupe is a shimmery taupe shade that is great for everyday and for office wear.$3.50. 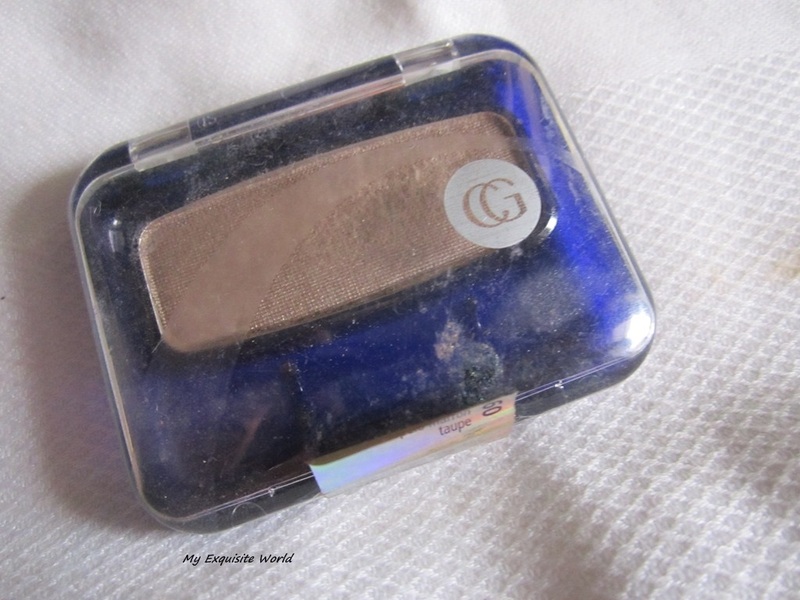 I enjoy wearing these shades.All are great can be worn with any other shade as well as alone.The quality of all the shades is really good and they provide decent wear time.All the shades (except Giordani Topaz Brown) are reviewed on the blog. I hope you like my compilation.Do you wear neutral shades? Do comment and share your views!! 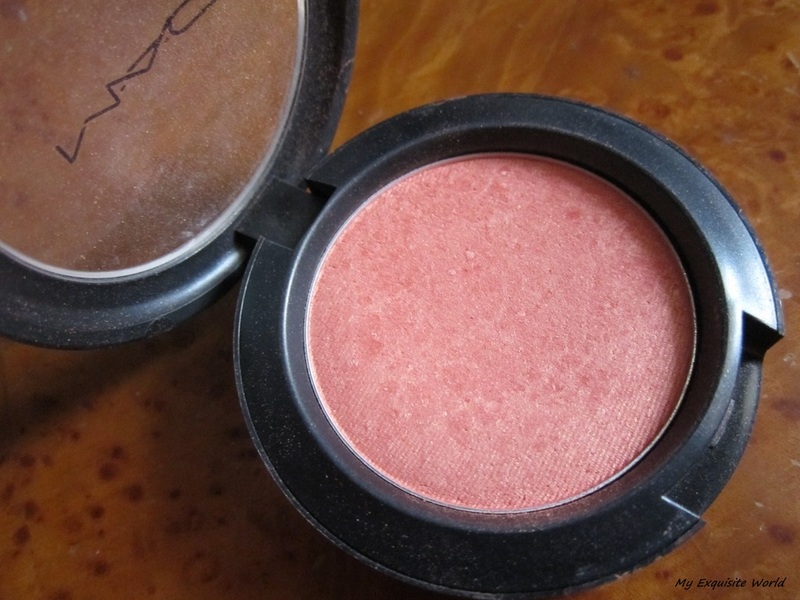 ~MAC Gingerly: Gingerly is a very pretty warm peach.It is like light brown with peach tones.The shade is great for a sun-kissed glow and looks gorgeous with all looks as it is a very versatile shade.I use this for contouring as well and it performs well there too! 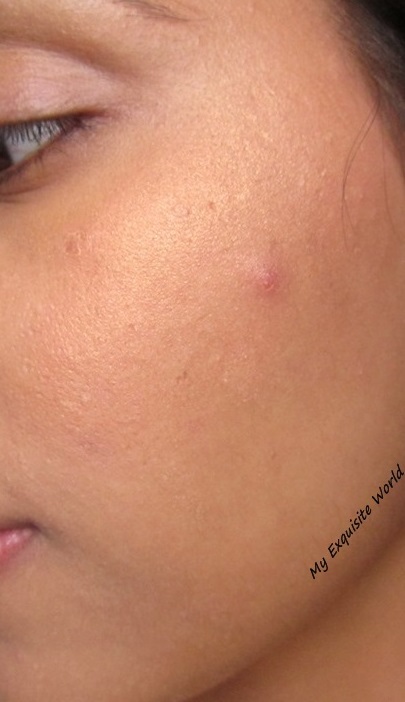 !The shade looks very natural on indian skin tone. PRICE: Rs.1150 for 6 gms. PRICE: rs.1550 for 4.5 gms. 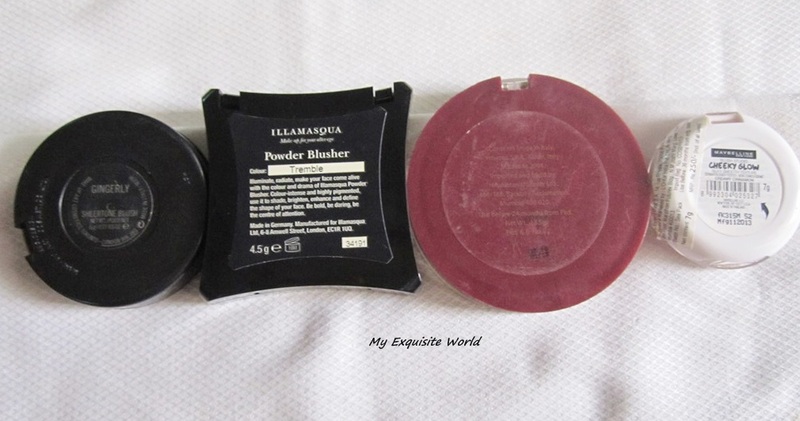 ~Lakme Earth Rose blush Trio: I adore this blush.My blush army started building after I used this blush.I learnt contouring,color application with this beauty and this is an important product for me.I love the way it adds warmth as well as colour to the face.It is stunning in design as well. 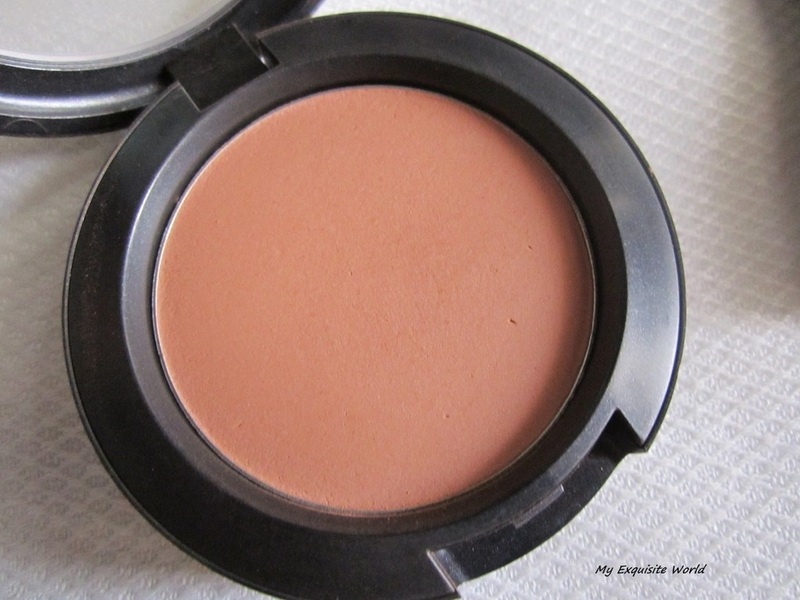 The blush has 3 shades incorporated in the design – a deep brown (for contouring), a peachy pink blush and a soft warm beige with slight shimmer for highlighting.The texture of this blush is soft and smooth and blend really well. 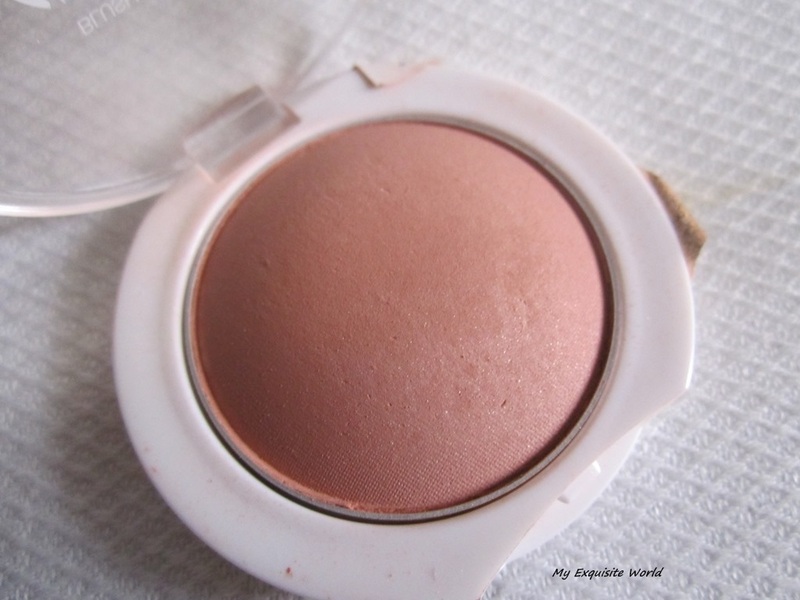 ~Maybelline Cheeky Glow Blush-Creamy Cinnamon: Creamy Cinnamon is a gorgeous earthy peach shade that is flattering on all skin tones.It can be a great contouring shade for those having very fair skin.It has fine shimmer in it which is barely visible.The shade itself is not so much visible on my face but it gives a finished look to face and doesn’t make it appear flat! 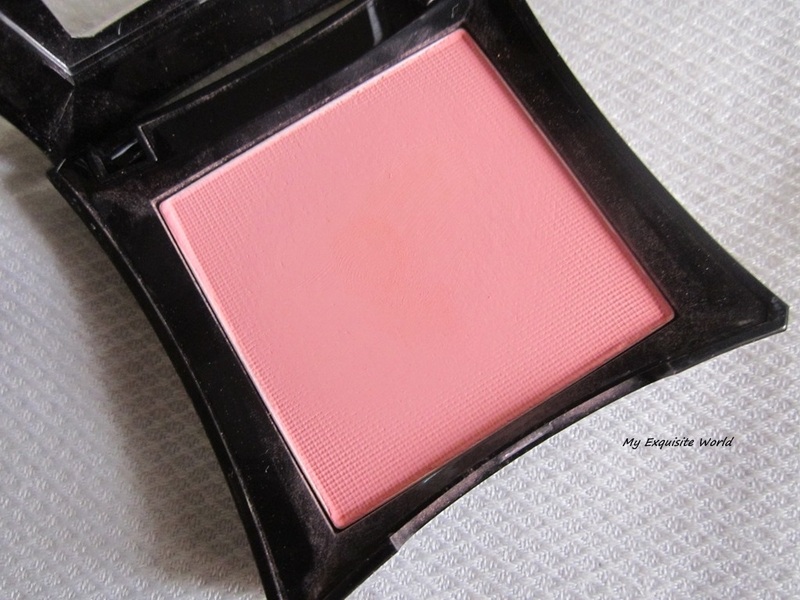 The pigmentation of the product is slightly low but buildable.I prefer my blushes to have buildable pigmentation so that they can be layered and this blush is great in that case.It doesn’t accentuate pores or clog them. 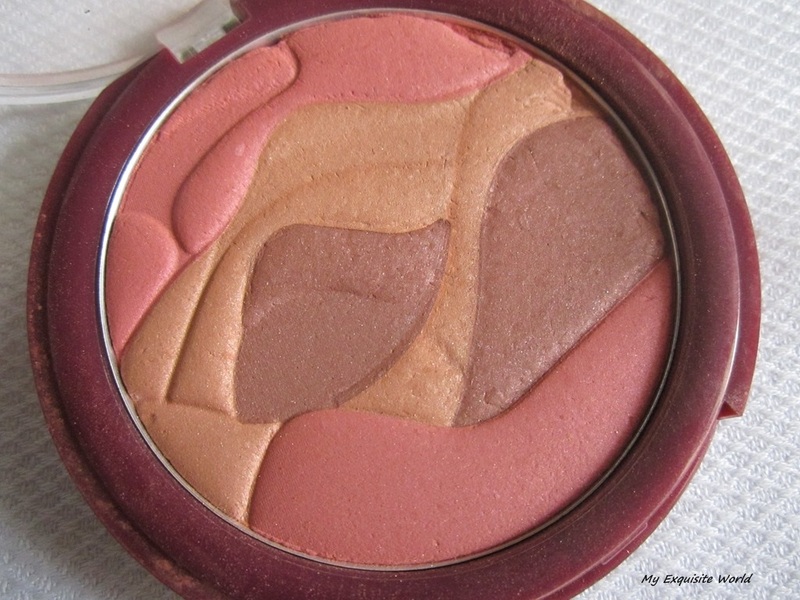 I hope you all liked my collection.I will be up with another post having shimmer blushes!! 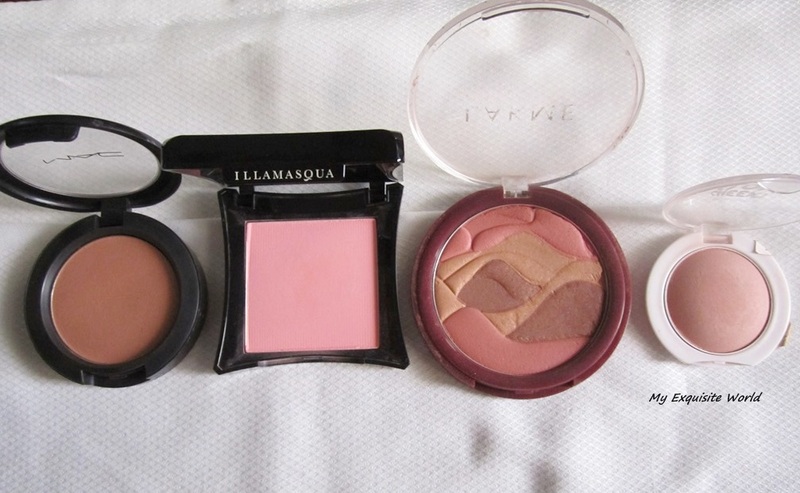 Have you used any of the shades mentioned above?? 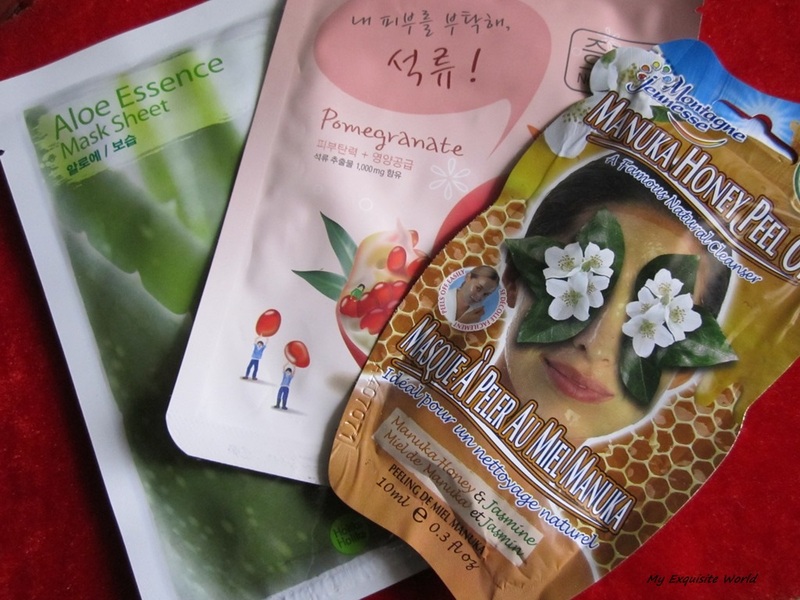 Providing a bit of treat to my skin in this scorching Delhi heat.These face masks are really good and easy to use!! 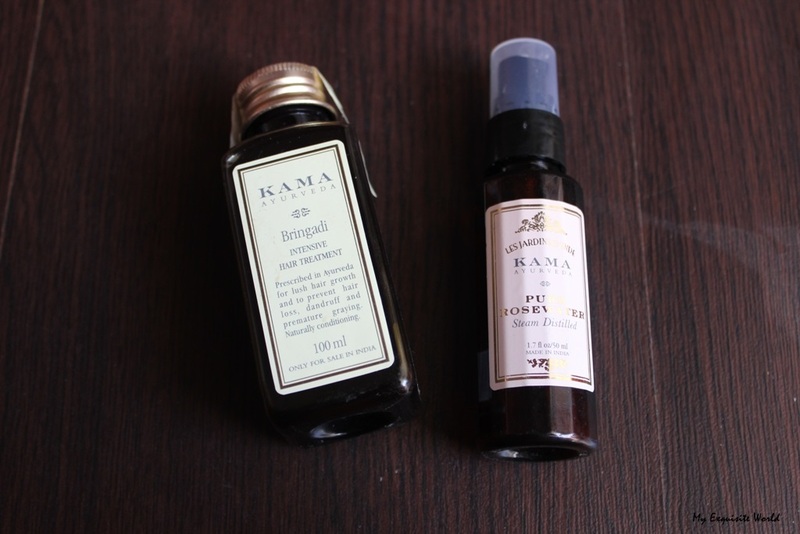 Are you providing any special treat to your skin this summers? Quick Look in 10 minutes!!! I mostly organize my time when I have to go for a special occasion but sometimes,we all have to get ready within a shorter span of time.I generally go for this kind of look though altering the eye shadow shades.It looks good and fresh!! 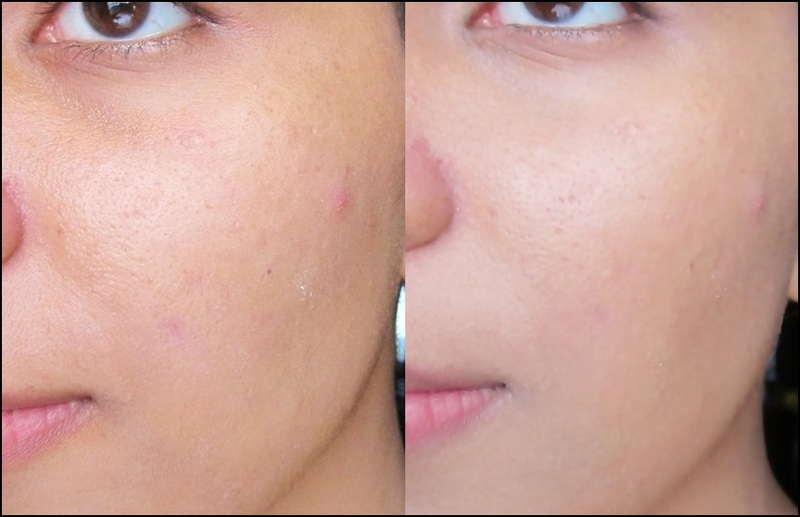 Foundation/Base: I have combination/oily skin so I generally use semi-matte finish foundation.However,these days I am liking dewy finish so I added my a bit of cream highlighter into the foundation for that glossy finished look.The highlighter should be used sparingly.It adds glow as well as a polished look to face.It dusted some compact to set the foundation. 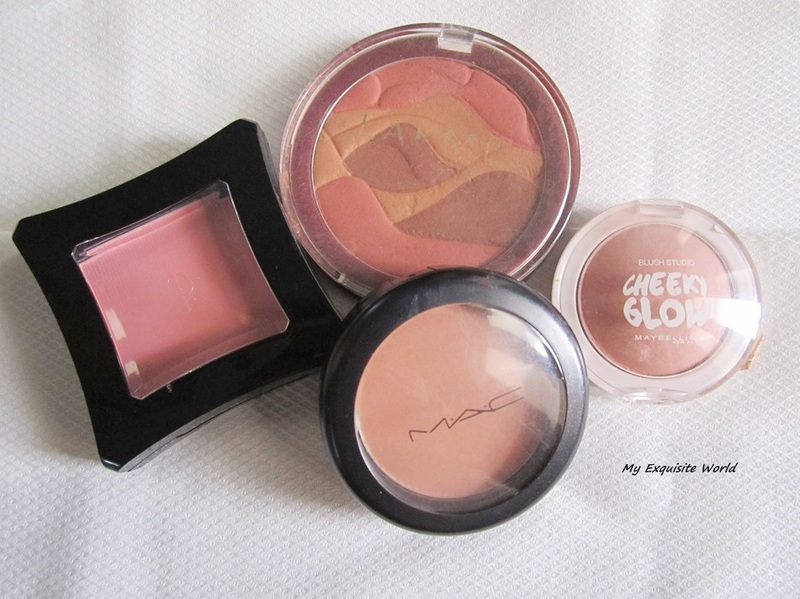 Cheeks:Next,I used a gorgeous peachy blush.MAC Style.I adds low as well as a bit of shade to face.You can contour your face after this or leave this as it is for natural look. 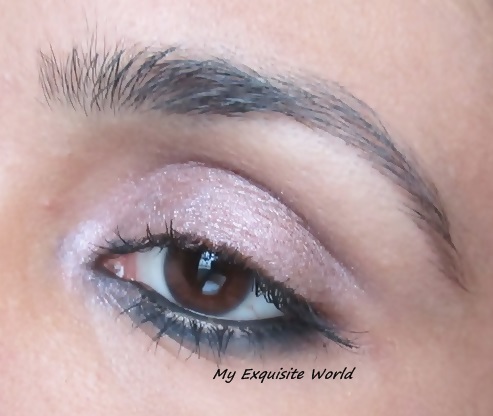 Eyes: The easiest and quickest way to have glam eyes along with precision is to use cream shadows.I used Oriflame Illuminate Eye Crayon in Purple Mist.It is a gorgeous shade that looks great on all skin tones.I used a matte plum brown shade in the crease. Tightlined my eyes with Lakme Absolute Kohl.I applied deep blue liner underneath my lower lids and smudged them a bit.This way,I added color to the eyes and its super quick and easy.Applied mascara and EYES re done!!!! Lips: This is absolutely your choice.I generally go for softer shades to keep the look subtle as I already have glow y face and well defined eyes.I used MAC Syrup and topped it with Bourjois baby pink colored lip gloss. Hope you all Like this Quick Look.It is super easy and takes very less time!! 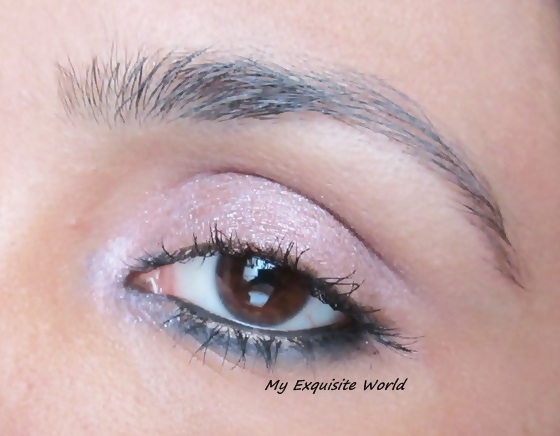 For eyes- Oriflame Illuminate Eye crayon- Purple Mist,Deborah Milano 24ore liner in Blue,Lakme Absolute Kohl,Maybelline Fierce and Tangy Color Tattoo for under eye,Bourjois Taupe Essentiel Eyeshadow. Stay Tuned for more girls! !